This tasty middle-eastern take on a simple salad is perfect as a side dish or for a mid-week dinner. Toast the pinenuts in a frying pan until golden. Soak the currants in warm water for 10 minutes then drain. Preheat a barbecue or char-grill pan. Gently toss the zucchini with the salt, lemon juice and half the olive oil. Grill the zucchini strips for 1 minute on each side until they are lightly grill-marked and wilted but not overcooked. 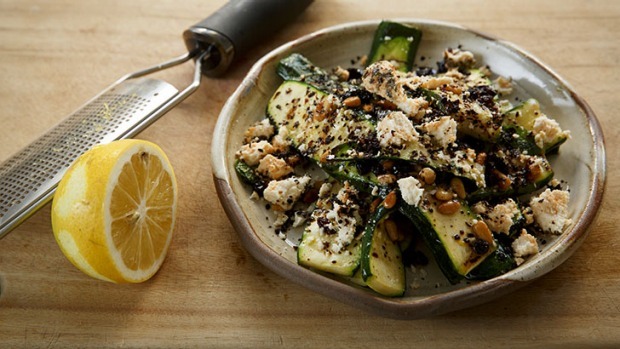 To serve, toss the zucchini with the lemon zest, pinenuts, currants and remaining olive oil. Arrange on a serving plate, scatter with the mint, shanklish and Turkish chilli and serve at room temperature. - I prefer not to put the zucchini salad in the fridge, as it dulls the flavour.